WASHINGTON (CNN) -- Where were you on the night of July 15? You may not even remember, but for me it was an extraordinary evening, an evening of unimaginable triumph and unbearable tragedy. 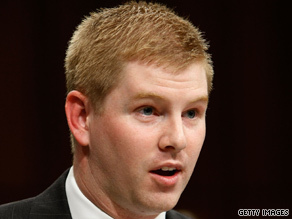 Andrew Kinard testifies before a Senate Armed Services subcommittee on April 29, 2009. But I would not actually know everything that happened until the night was long over. A couple of weeks before July 15, a friend who works with injured troops emailed me to say it was time for Andrew's going away party. Andrew Kinard is a young Marine I first met a few years ago at Walter Reed Army Medical Center in Washington where he was recovering from a devastating IED attack in Iraq. He had stepped on the roadside bomb and lost his entire body below the hips. The party being arranged was Andrew's farewell to D.C. Andrew is off to the rigors of Harvard Law School. He's says he's itching to get into a courtroom. You need to remember the name Andrew Kinard. Many of his friends believe Andrew is such an amazing man that he will become president of the United States. If I had to bet, I'd say it could happen. I wouldn't have missed the party for the world. I was touched that this tight-knit community of wounded warriors had included me in this very special, very intimate evening. There was a display of photos of Andrew serving in Iraq. I suddenly realized I never knew how tall he was before the war. There were a few sniffles and wiping of eyes in the room for a Marine whose dream of service to his country ended within a few months of getting to Iraq. But sniffles didn't last long and the evening became one of hugs, laughter and good wishes (and more than a few beers) for a young Marine who had triumphed over what the war had dealt him. But my warm feelings didn't last long. The next day another source in the wounded troop community came to me in the Pentagon hallway with another tale. "You have to do something about the story of Ray Rivas," he said. In the very hours we were celebrating Andrew in Washington, tragedy was unfolding in Texas. Lt. Col. Raymond Rivas, a 53-year old civil affairs officer who had dedicated his career to rebuilding war torn countries, was found dead in his car in the parking lot of Brooke Army Medical Center in San Antonio Texas. Colleagues of Ray's said prescription pills and notes he wrote to his family and wife, Colleen, were found. A military source told me all indications are Ray took his own life. His devastated family understandably declined to talk publicly, and the military won't discuss the case citing privacy concerns. But friends and colleagues I spoke to confirmed that Ray had suffered multiple blast injuries to his brain from bomb attacks during several deployments over the years. In October 2006, Ray survived an attack in Iraq that rendered him briefly unconscious. He was transferred to Europe but somehow talked the doctors into sending him back to the war zone. A week later, ill and confused, he was sent back to the United States. A close associate tells me that at first, despite being diagnosed with traumatic brain injury in Iraq, some doctors thought Ray might be suffering from post-traumatic stress disorder. They didn't realize he had all the symptoms of traumatic brain injury. He had trouble talking, reasoning and remembering. He was sent to Brooke Army Medical Center in San Antonio so he could be near his family, but for the first few months he just sat in his room. Fellow soldiers helped him with his bathing, dressing and eating. Finally, Ray was assigned a case manager, and things began to move rapidly. He got therapy and was able to go home. But by all accounts from his friends, Ray had become seriously debilitated by the injuries to his brain. A private email shown to CNN revealed that Ray had been diagnosed with rapidly emerging Alzheimer's disease. The cumulative impact of all those bomb blasts were destroying his brain. Colleagues say Ray knew he might have to move to an assisted living facility. Ray's doctors are not discussing his treatment because of privacy concerns. A colleague told me Ray was tired and in pain on the night of July 15. He was found in his car in the parking lot at the army hospital where he had spent so long trying to get better. But Ray will be remembered for all he did for others. Even with all his suffering, he wanted to make sure other injured troops were helped. In April he and his wife Colleen went to Capitol Hill to testify with other wounded warriors about their needs. Sitting on that panel with Ray was Andrew Kinard.